Dream Pod 9: JC Fleet Scale Exo Armors Preview! A cool treat today, Tony finished up the 3d models of the exo armors he was working on for Jovian Chronicles Fleet Scale. Checkout the image below of the of the small 15mm tall Wyvern, Syreen, Pathfinder, and Hector 3d models added to a photo of the existing Fleet Scale fighter squads, flight stands, spaceships, and a ruler for scale. He even made a commander models for each exo, so each squad base will have a commander and 2 stock models. Plus he gave the commanders different weapons and poses, the Wyvern commander got an axe and smaller main gun, the Syreen got a more dramatic pose with the shoulders swept back, the Pathfinder got a different gun plus a plasma lance, and the Hector got a plasma lance. The JC Fleet Scale Exo Armor 2 Squad Packs will each included 6 small 15mm tall exo armors (4 stock models and 2 commander models) along with two of our new 3 pronged poseable flight stands in pewter with a black plastic bases. We have the 4 new Exo Armor 2 Squad Packs up for Pre-Order on the Dream Pod 9 Online Store now. 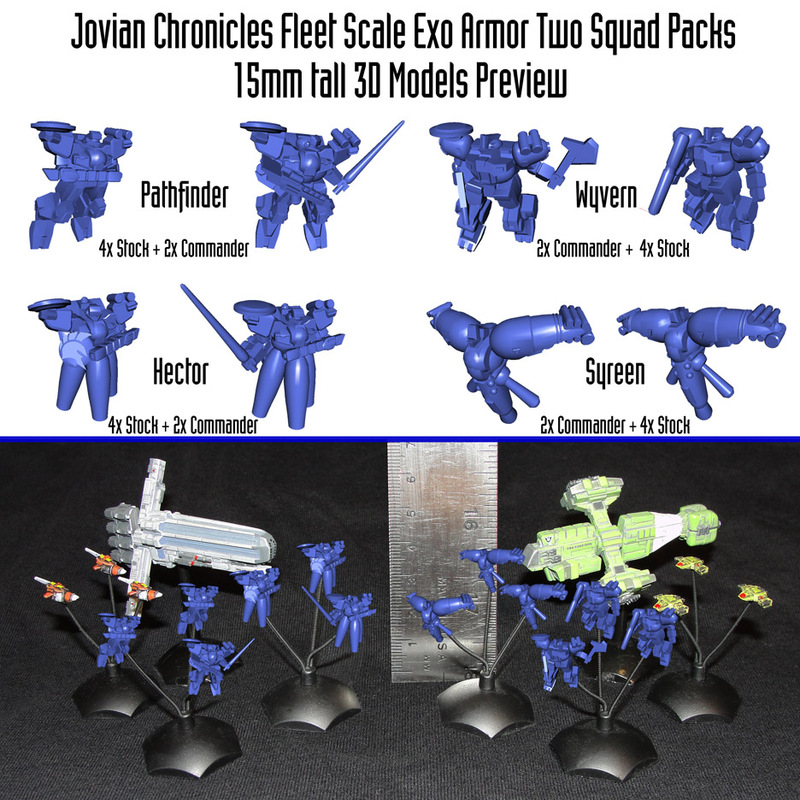 If your interested in a future Jovian Chronicles Fleet Scale Tabletop Wargame and more Fleet Scale miniatures let us know with your comments and support by sharing this post and a purchase of the new products. Pre-Orders will ship in Early March 2016, once the 3d models are back from rapid prototyping, production molds made and the pewter miniatures cast up. Here is a link to the Jovian Chronicles miniatures section of the Dream Pod 9 Online Store to place your Pre-Order today. Home › Blogs › Robert Dubois's blog › JC Fleet Scale Exo Armors Preview!